New Approach to Statutory Interpretation? In upholding the bank’s late payment fee in Paciocco, the High Court recognised that in certain cases, the validity of an impugned penalty clause may now be determined by reference to damage to legitimate, commercial or other interests over and above compensable damage ordinarily recoverable in an action for breach of contract. In doing so, the Court followed some of the reasoning of the UK Supreme Court in the recent Cavendish and ParkingEye litigation. This article analyses the Court’s judgment, its implications for the penalty doctrine and the ongoing relevance of Lord Dunedin’s well known propositions in the Dunlop case. Since Federation the High Court has provided the major judicial guidance for Australian construction lawyers notwithstanding that for most of that time the Privy Council remained the ultimate court of appeal. One might reasonably have expected to see an enhancement of the role with the abolition of appeals to the Privy Council. However, the subsequent period has seen a continuing decline in the instances of the High Court identifying an issue of principle in construction law that warranted the granting of special leave. Moreover, where the Court has granted special leave it has largely been in cases involving non-contractual relationships. 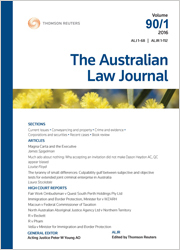 In analysing the contribution of the High Court to Australian construction law over the last half century in both substantive and quantitative terms this article examines why the decline occurred and submits a view as to what the 21st century might hold for the High Court and this field of the law. For the PDF version of the table of contents, click here: ALJ Vol 91 No 12 Contents.